If you're looking for a way to have everyone take part in a build, then one of our BIG Builds is the way forward. 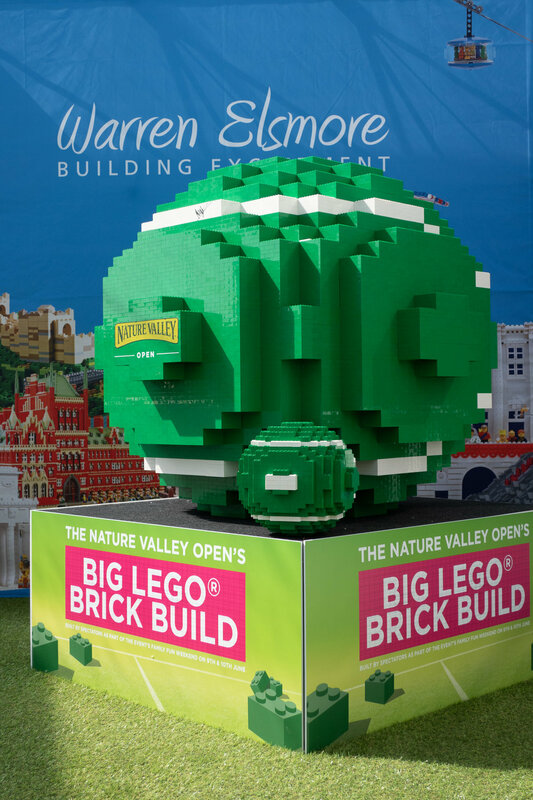 You've probably seen one or two of them in the past - 10's of thousands of bricks, one of our Master Builders and a lot of help. Well, this summer has been busy with those too! We started the summer of builds in two places at once - the Nottingham Tennis Open asked us to build them a HUGE tennis ball. Really huge. We had just two days to build this ball in some very un-British weather! The sun came out and , as we worked under a clear marquee roof - it got warmer and warmer. We still got the job done though and of course had our ball signed by one of the top seeds. Whilst Warren and Teresa were in Nottingham, Kirsten and Alastair were only just up the road at the Midland Railway Museum. We were tasked to re-create one of their locos in LEGO to start 'Butterley Brick Week'. Not the easiest of BIG Builds, especially as there's nothing between the wheels! We met the challenge though, there's nothing an experienced builder can't accomplish. Next up was Dollar Academy. One of the top private schools in Scotland, they were celebrating their bi-centenary. It's not often that you get to celebrate 200 years of anything, so what better way than to ask all your pupils to help build a BIG model of your main building? Think we're done yet? How about a world famous stunt display team. The Red Arrows no less? With the RAF recently donating one of their planes to the National Museum of Flight - it seemed only right that we should celebrate that with a BIG build. The plane itself might have been a bit too challenging to complete in a day, but how about a Red Arrows pilot? Now for the biggest of BIG Builds. Maybe a BIG BUILD? Over a full 6 days, this got almost all of the team involved. Nottingham Castle (yes, that one with the Sheriff of Nottingham) are closing this summer for a huge 2 year renovation. 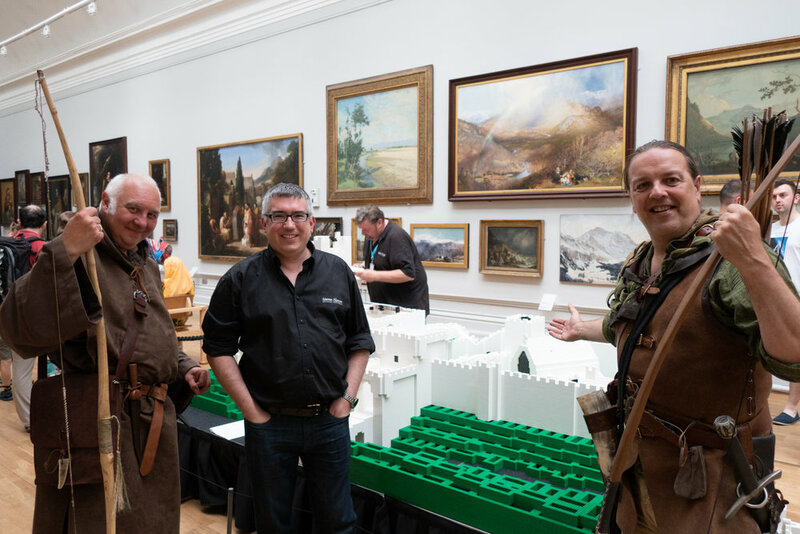 They wanted to go out with a special celebration - so as well as opening the doors to the public for free, they wanted to recreate the castle as it was around 1485. That's no small ask and it ended up using around 150,000 bricks. That's a lot of BIG Bricks! Oh, and yes - and we got to the meet the (official) Robin Hood! Nearly last - a red squirrel! More complex than it looks, this big squirrel was built for the Clackmannanshire Third Sector Interface (CTSI to you and me!) as part of an exhibition that we put on over the summer. 'Sandy' is the mascot of the CTSI and was built with the help of the local public and an army of volunteers. Which is handy, considering that's what CTSI do themselves! And... last but not least - we've another few BIG Builds yet to come this summer. On the 1st September we'll be attempting to build the worlds' largest LEGO needle. In the Needle Museum of course! More details of that one here. Now, what about you - is there something you'd like to build really BIG out of LEGO bricks? Why not get in touch, it's cheaper than you might think!